American hard rock band Guns N' Roses were formed in Los Angeles in 1985. The original lineup consisted of Axl Rose, Slash, Izzy Stradlin, Duff McKagan and Steven Adler. 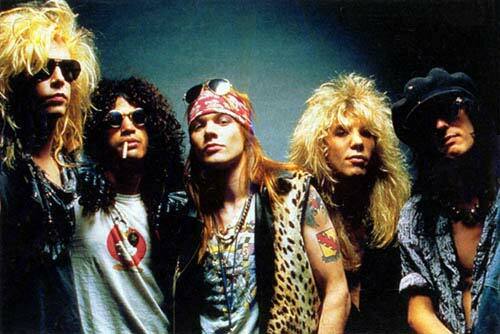 Guns N' Roses have produced 6 studio albums, one live album and sold over 100 million records worldwide. Their debut album Appetite For Destruction sold 28 million albums alone and spawned some of the best known heavy metal hits like, "Welcome To The Jungle", "Sweet Child O' Mine" and "Paradise City". Currently the only original member you will see on tour is Axl Rose backed by lead guitarists Ron "Bumblefoot" Thal and DJ Ashba, rhythm guitarist Richard Fortus, bassist Tommy Stinson, keyboardists and backing vocalists Dizzy Reed and Chris Pitman and drummer Frank Ferrer. Check out the current line up and current concert dates for Guns N' Roses!